Too often passengers in automobiles experience an accident, and the seat belt or airbags fail to work or deploy. Typically, the airbag sensor is not triggered because the impact occurs at a different location on the vehicle. Other times, the impact is simply not hard enough to trigger the kinetic energy required to set off the deploying mechanism. With seatbelts, the tension springs may fail to operate giving unnecessary slack to the belt, or the locking device may fail to secure the belt when required. Due to the expense of litigating these cases (discussed below), often it is easier to just look at the primary cause of the accident. Because these devices are secondary causes of injury, normally attorneys will focus the recovery on the obvious tortfeasor (at fault party) and the associated insurance proceeds. In the event there is no at fault party, or the proceeds from the tortfeasor are not enough to cover the damage, then a products liability lawsuit may be considered. Under these circumstances, three primary issues need to be addressed. First, did the damages and injuries sustained in the accident result from a failure of the devices. 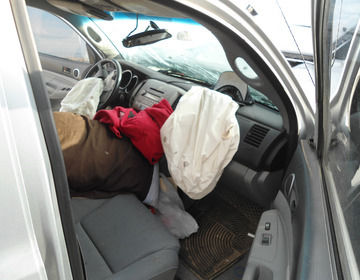 For example, did the victim suffer a head injury or laceration that would have been prevented had the airbag deployed-is there a causal relationship between the failure and the injury? If not, then the analysis stops. If yes, then a second prong must be analyzed: is the injury substantial in nature to justify a products liability lawsuit? Does the expense of a products liability lawsuit, e.g. costs of lawsuit, hiring experts, storage of the items, performing testing, etc., outweigh the value of the injury? If yes, then the analysis stops. If no, then the final prong must be looked at. Do you still have the evidence? If the car is gone to the dump or salvage yard, evidence is lost and so is the case. Preservation is key to any major accident and products liability lawsuit. These are the major concerns to be analyzed, however, there are some other issues to discuss. Who caused the accident? If the driver falls asleep and rolls five times in the desert, and the seatbelt fails or airbag fails to deploy, does the accident have jury appeal? Arguably no. It is a difficult proposition to hold accountable a "non-party" e.g. car / parts manufacturer: Ford, General Motors, Chrysler, etc.) for the wrongful act of another, here, the driver, as the safety devices were a secondary cause. On the other hand, when a consumer purchases a vehicle with such safety devices, they expect them to operate as promised. These may also trigger other causes of action such as warranty of merchantability and other contractual/tort/product liability recovery theories. A better example is the driver who is on a country road and hits a wild animal-a deer or bison crossing the road. Here, the facts have changed. Also assuming in this example, the deer jumped unexpectedly through the front portion of the car slamming into the airbag sensor and through the windshield. Now, the operator and/or purchaser of the vehicle has a much stronger argument that the product failed and rights to damages are warranted. Benson and Bingham specialize in products liability and automobile accident cases. Call today for a free consultation.